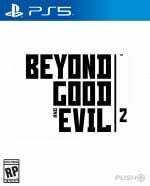 It had seemed for the longest time as though the elusive sequel to PS2 cult classic Beyond Good & Evil would never happen. But it actually jumped out of hiding today during Ubisoft's E3 press conference via a stunning trailer. A teary-eyed Michel Ancel – series creator who is also famed for the colourful Rayman series – introduced the game accompanying a heartfelt thank you to Ubisoft CEO Yves Guillemot. It's hard to imagine many other publishers allowing a sequel to such an underappreciated IP, after all. Beyond Good & Evil 2 will take place before the events of the original game, and in the trailer above we're introduced to a distinct ragtag group of characters set in a colourful and socially diverse world - and there was mention of a seamless online environment. Hmmmmm. No release date was announced and details remain scarce, but it looks like it really is happening. Hallelujah! Will wait and see how this one turns out. Such a well realised trailer/world, and then they had to mention online stuff. Eeeeaaaargh I hope it's good. Looks interesting. Not quite what I was hoping for, but it's nice to see a new Beyond Good and Evil at least. Not sure if it's just me - but does anyone else find all the F-bombs really jarring? It's like they got a 15-year-old to write a large portion of that script. It feels like a poor attempt at being edgy. I just couldn't believe there is that much language in a game that is a sequel to a 7+ rated adventure game lol. I just hope they don't change it too much to make it all 'mature'. This just broke my heart. What did they do? I loved BG&E and this new game is filth, with the cursing and the provocative dress. There was none of that in the last game. What possesed them to go this route? I'm am crushed. So long as Michel Ancel is still directing, I'll have an ounce of faith in this, modern Ubisoft and all. Really disappointed that it's a prequel though. Like some of you on here I found the swearing completely unnecessary.The game looks like it could be fun but that monkey has already annoyed the hell out of me.And an online environment?I'm not sold on this one. Yeah I swear as much as the next northern scallywag but it felt well out of place. Typical edgy Ubisoft. The whole thing just looked like such edgelord bullshizz. The swearing, the cleavage, she smug monkey... It just came off as desperate to me. The trailer looked nice, granted, but the game itself is not going to look like that. It's a bit puzzling why they went in this direction. meh. the f bombs really turned me off. not how i thought of the first game. so much for sharing this with my two kids aged 12 and 10. @Buizel hated the f-bombs. It was completely unecessary and is not the same bg&e I remember. it felt like I was watching a trailer for saints row or something. Still, lets hope that when the gameplay emerges, it will sparkle. I remain optimistic. It is a surprise after all!